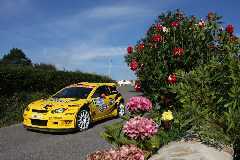 Guy Wilks was delighted with the promising performance of his Proton on Spains Rally Principe de Asturias. The all-new Proton Satria Neo Super 2000 which uses the latest technology CAN network systems (connected using a Bremax wiring harness!) has closed the gap to its more established IRC rivals to less than one second per km on tarmac. Guy and co-driver Phil Pugh were fifth in the MEM-run Proton before a broken drive shaft and a puncture dropped them to tenth on Fridays last stage. They climbed to ninth on Saturdays first stage but went off the road on SS11. Guy bounced back with a string of solid times - including joint fourth fastest on SS15 - to cross the finish line in 19th place.